You may already be familiar with Mimouna, a Sephardic holiday that originated in Morocco and marks the end of Passover. On the night following the last day of Passover, the end of eight chametz-free days is celebrated with a feast of treats. In Morocco, neighbors travel to each other’s houses, it is customary to leave all doors open to welcome any possible guests. Tables are laden with symbols to ensure a good year: blossoming spring flowers, fish for abundance and fertility, and dates sweetened with honey to inspire an equally sweet life. The next day, festivities continue with barbecues, picnics, and large gatherings. 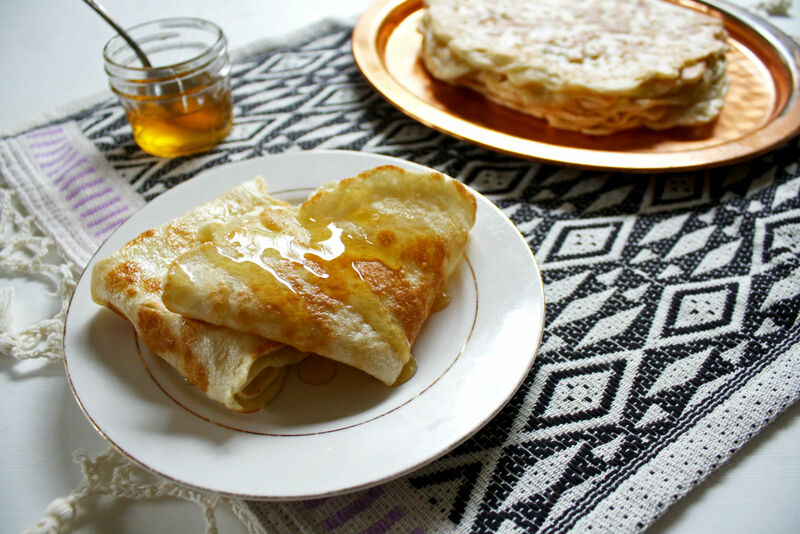 One of the most common dishes prepared for Mimouna is the crepe-like mufleta (or moufleta). You might also find nougat, fazuelos (a fried thin pastry), couscous-au-lait (sweet couscous with milk), almond cookies, marzipan, stuffed dates, and a variety of other sweet and savory baked goods. In recent years Mimouna’s popularity has expanded beyond North Africa and is even widely celebrated in Israel. Two of my favorite dishes for this holiday are the crepe-like mufleta and sweet stuffed dates. My stuffed dates are a slight deviation from the norm. 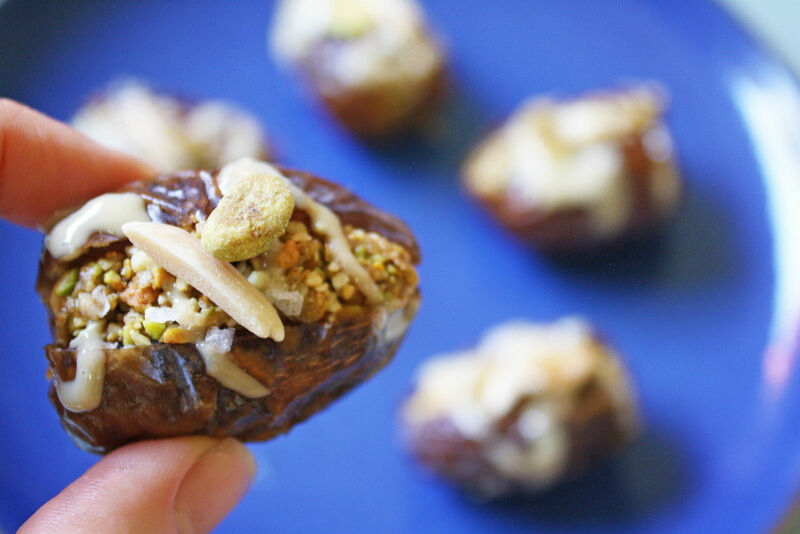 Instead of marzipan, these dates are stuffed with a combination of pistachio and almond. They are sweetened only slightly with honey, and then drizzled with tahini, and a generous pinch of flaky salt. They are a delicious celebratory treat but they also make a delightful snack any time. I hope this year brings you your own Mimouna parties, or a chance to throw your own with these delicious treats. And for more Moroccan Jewish food, check out some of our favorite dishes. In a food processor, combine the almonds, pistachios, honey, salt, and spices until very finely chopped, but be careful not to overmix or the mixture can become like a nut butter. (If you don’t have a food processor you can finely chop the nuts by hand and combine everything together in a bowl). Slice the dates down the middle lengthwise, removing the pit, but keeping them intact. Fill the dates with the nut mixture. 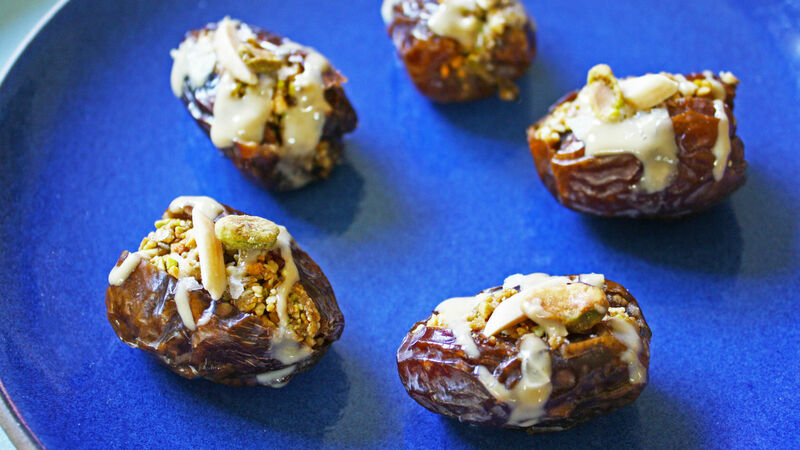 Just before serving, drizzle the dates with good quality tahini and a sprinkle of salt. Store in the fridge for up to 1 week without the tahini and salt. All our favorite delicious things in 2017. Couscous might be taking over America very soon.